Have a question about Mid Cape Discount Oil? Before you contact us, we invite you to take a look at some of our most commonly asked questions. We’ve answered them below for your convenience. Follow these four steps for the easiest fuel delivery and payment process on the Cape. We recommend you wait and save money! Who is Mid Cape Discount Oil? Mid Cape Discount Oil provides low-priced heating oil delivery service to homes throughout the mid-to-lower portion of Cape Cod. Offering some of the most competitive home heating oil prices in this area of Massachusetts, Mid Cape Discount Oil is one of the Cape’s leading discount fuel providers. We are affiliated with Snow’s Fuel Company, the Lower Cape’s premier full-service energy provider. Working with Snow’s, we are able to offer more to Mid Cape Discount Oil customers in terms of options for heating services, air conditioning services, home monitoring protection, and more. 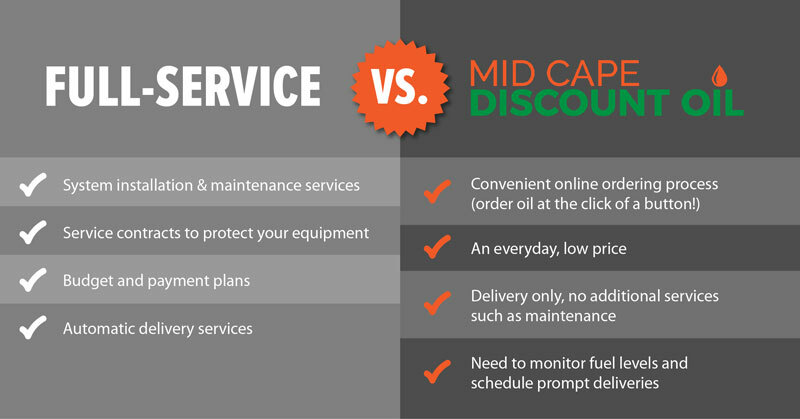 Why choose Mid Cape Discount Oil vs. full service? Full-service energy companies offer a different experience for consumers than discount fuel companies. With a discounter, or COD company, you can benefit from the lowest heating oil prices in the area without any hidden fees or hoops to jump through. Simply place an order and you’re all set! How is Mid Cape Discount Oil so affordably priced? There are a lot of factors that go into the low price per gallon we offer Cape Cod oil heat consumers. Some of these factors are labor of staff, cost of delivery, and receivables. Because Mid Cape Discount Oil fuel orders are placed online, it greatly lessens labor and phone costs, as payment processing is done automatically and prior to fuel delivery. By doing this, it eliminates bad debt and receivable carry costs. We are then able to draft and plan for our delivery routes in advance, which reduces our delivery costs, resulting in greater savings for you. Which Cape Cod towns do you deliver discount oil to? To find out if we deliver discount heating oil to your home, our website conveniently lists all of our current delivery towns. We have an easy-to-use service area map that you can refer to. Not only that, but when you enter your zip code, our online ordering system will confirm our availability to your area. If we do not currently deliver to your town and you would like our consideration, please feel free to contact us, as our delivery area may have room for expansion soon! Does Mid Cape Discount Oil have a minimum oil delivery? The minimum delivery is 100 gallons. If we deliver less than 100 gallons a short order fee of $25 will be deducted from your credit. Do you deliver oil to rental properties and businesses? Mid Cape Discount Oil provides competitively priced heating oil to residential homeowners and rental customers in our service area. Renters in particular will find us especially convenient! For commercial customers, please call Snow’s Fuel Company at (508) 255-1090. Does my tank need an inspection? Your oil tank must be inspected by a Mid Cape Discount Oil driver prior to your first delivery. You will need to grant access to your oil tank or be home to allow the driver to visually inspect your tank. Please leave details for how the driver may access your oil tank in the fill location field when you place your order. It is our goal to provide next day delivery for all customers; however, we do ask that you allow 24 to 48 hours for your delivery, weather permitting. Same day or next day delivery is available for an additional fee. Choose same day or next day under “Extra Charges” while you are placing your order. Please also note that your oil tank must be inspected by a Mid Cape Discount Oil driver prior to first delivery. Contact us for more new customer details. Thank you! Do I need to be home when you deliver my fuel? Unless you have a specific question or have requested a special service, no, you do not need to be home when we deliver your fuel. Please note that if this is your first delivery you will need to be home or grant access to your oil tank for a visual inspection by a Mid Cape Discount Oil driver. You may explain how the driver may access your oil tank in the fill location field when you place your order. You are also responsible for making sure there are no obstructions, inside or outside of your property, that will prevent our delivery drivers from accessing your heating oil fill. If our delivery driver is physically unable to access your tank’s fill, a fee may be assessed. Contact us if you have questions about this. We only deliver during normal business hours Monday through Friday, excluding holidays. What do I need to do to place my order online? Placing a fuel order is easy with Mid Cape Discount Oil! All you need to do is sign up for an online account right here on our website. Then, you can come and go as you please, placing fuel orders as you need them. Can I trust your website with my credit card information? Our secure online ordering and payment portal will keep your information private from the moment you enter it. If you have any hesitations about paying for your fuel online, please contact us and we will provide you further details to put you at ease! Which forms of payment do you accept for oil delivery? Mid Cape Discount Oil accepts the following major credit cards: MasterCard, Visa, or Discover. As payment is made before delivery, cash and check are not accepted. Our fuel drivers do not accept any kind of payment, nor can payment be mailed in. By accepting paying through our online ordering system we are able to keep our prices low. If I pay by credit card, when will my card be charged? Your credit card will be charged when you place your order. The charge will reflect the price per gallon listed at the time of your order placement. Thank you for choosing Mid Cape Discount Oil!